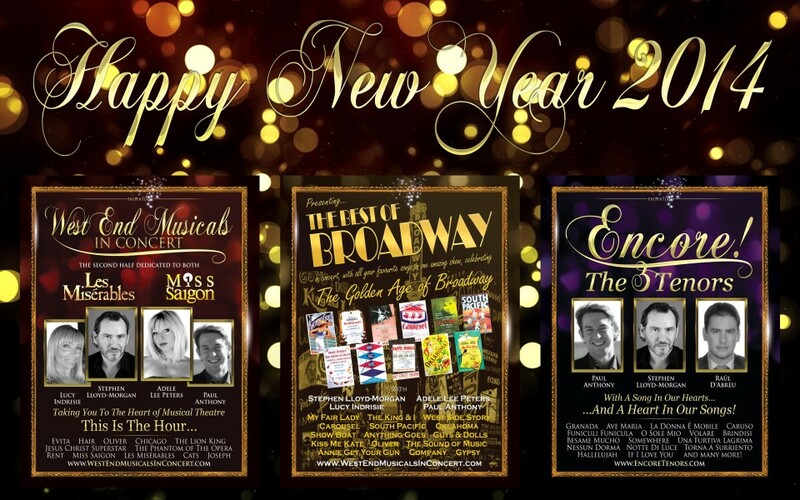 Happy New Year 2014 from West End Musicals, Encore! The 3 Tenors & The Best of Broadway | Marbella Marbella – Adelante! We’ve had a fantastic year showcasing our new productions this year with a total of 50 shows! AND WE ARE REALLY EXCITED BECAUSE NEXT YEAR WE ARE GOING BIG! Large scale theatre-style productions will start in the late spring of 2014. We aim to bring you the very best musical theatre and 3 tenors’ shows available on The Costa del Sol! The Best of Broadway, West End Musicals in Concert, Encore The 3 Tenors & Music of the Night with Stephen Lloyd-Morgan, Adele Lee Peters, Raul D´Abreu, Paul Anthony, Lucy Indresie and many special guests including soprano Julie-Anne Hunter will be staged at a well-known prestigious centrally located venue with capacity for 600. Thank you to everyone who has supported the shows this year! We would like to wish you all a very peaceful, healthy and happy New Year 2014! Tom Jones – Special performance in Marbella.